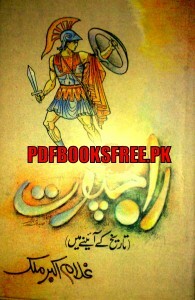 Rajput Tareek Ke Aaine Main Authored by Ghulam Akbar Malik. In the present book “ Rajpoot Tareekh Ki Aine Main” Rajput in the Mirror of Histy” Mr. Ghulam Akbar Malik discussed the history of the Rajput community in very interesting and worthwhile style. First of all he explain meaning of the “Rajput” word with the help of linguistic origins and obvious ways. Then he has discussed the initial configuration of the Rajput community, their social circumstances, their position in the society and enriching their initial organization and so on. He divided the Rajput nation into three major groups in terms of race. In short words, this books is a comprehensive literature on the complete history of Rajput community in Urdu language. Visit the following link to read online and also download full version of Rajput Tareekh Ke Aaine Main book in Pdf format for offline reading.